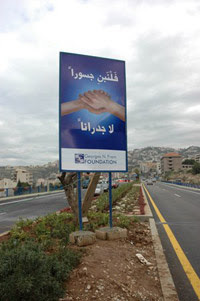 OUTBOUND E-newsletter: "Let's Build Bridges, Not Walls"
Traffic flows normally now on Jounieh's Ghazir Bridge, which incurred heavy damage in July 2006. 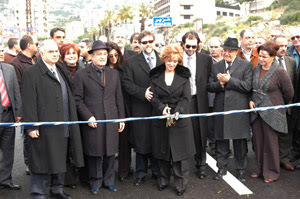 On Friday, 16 February 2007, Georges N. Frem Foundation inaugurated the re-opening of Ghazir Bridge to normal traffic. Hayat Frem, wife of the late minister, Georges Frem, cut the ceremonial rope under the slogan "Let's build bridges, not walls". Ghazir Bridge was heavily damaged during an Israeli air attack on 4 August 2006. 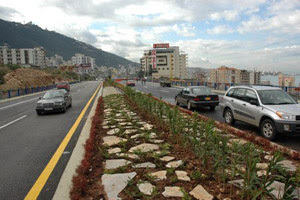 Located 20 kilometers north of Beirut, the bridge is vital to north-south transport along the Lebanese coast and movement through the city of Jounieh. Georges N. Frem Foundation requested formal approval from the Lebanese government to reconstruct the bridge only weeks after the damage. After a study to understand elevation and capacity of the bridge, a specialized team of engineers and contractors began work. After the attack and during the reconstruction period, diverted traffic often caused considerable jams and delays. Over the past five months, contractors worked around-the-clock to strengthen the bridge's steel base using Swiss technology, change all existing pipes under the bridge, and fix breakages caused prior to the attack. Contractors also added empty pipes beneath the bridge to facilitate cable extensions for future telephone, electricity, and water infrastructure. All contracting works followed the legal and technical requirements set forth by the Council of Development and Reconstruction (CDR). Georges N. Frem Foundation monitored all stages of the reconstruction to ensure safety of citizens and transparency throughout the project. Further, the foundation made certain that all work was completed in accordance with Georges Frem's mission to serve the community and the people of Lebanon. Georges N. Frem Foundation is a private, non-corporate foundation devoted to public education, civil society, and economic development initiatives in Lebanon.